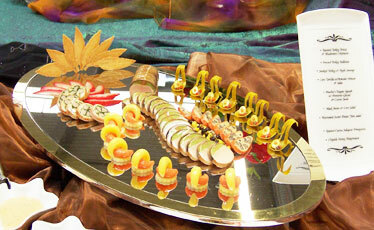 Students demonstrate their artistry with platter displays such as this one at the Student Culinary Expo. Culinary students put their skills to the test at Saturday's Hawaii Student Culinary Expo at Kapiolani Community College. Students will compete in the preparation of hot and cold foods and pastry. Much of this will take place in a closed kitchen, but the pastry entries will be on display from 10 a.m. to 2 p.m. in the cafeteria. Three American Culinary Foundation judges -- Stafford Decambra, Rene Marquis and Wolfgang Bierer -- will evaluate the contestants, but the day before, diners can evaluate the judges' cooking skills. They'll offer a three-course lunch at 11 a.m. Friday in the Ka Ikena Dining Room. Melody Rose Lindsay is the youngest student to be accepted into the harp program at Indiana University’s School of Music. What does it take to win international recognition on the harp at the age of 16? 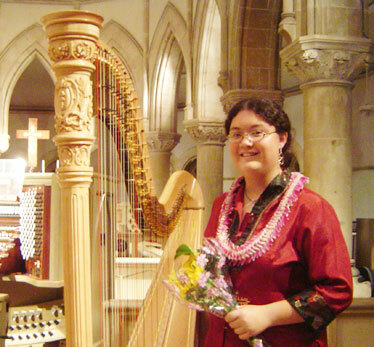 Melody Rose Lindsay provides a preview in a free concert, "Harping Around the World," 5:30 to 6:30 p.m. Sunday at Kaimuki Christian Church, 1117 Koko Head Ave. The 'Iolani School junior will perform Marcel Grandjany's "Fantaisie," an arrangement of Gershwin's "American in Paris" and Eleanor Fell's "Rhapsody in Blue." She'll also play two of her own compositions and an arrangement of Keali'I Reichel's "Kawaipunahele." Guest performer is Christopher Lindsay, 9-year old flautist. Lindsay has been chosen by the World Harp Congress Association to represent the United States at the 2008 World Harp Congress Focus on Youth program in Amsterdam this summer. The trip comes on the heels of her performance at the 2005 World Harp Congress in Dublin, Ireland. A film series at StudioBe in Chinatown Friday pays tribute to Mother Earth. The EarthDay Film Showcase begins at 7 p.m. Donation of $10 is requested. StudioBe is at 1192 Smith St.
"The Da Versity Code": An age-old secret is exposed. "Grocery Store Wars": About "the dark side of the farm." "Meatrix": This spoof of "The Matrix" films highlights problems with factory farming, featuring a young pig, Leo. "Climate: A Crisis Averted": Set in 2056 and recounts how ordinary people took action to clean up the Earth. "Story of Stuff": A provocative tour of consumer culture. "Kilowatt Hours": A plan to re-energize America. Hongwanji Mission School's Performing Theatre will present "The Emperor's New Clothes!" 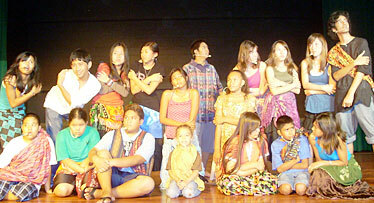 at 7:30 p.m. Friday and Saturday at the Honpa Hongwanji Hawaii Betsuin social hall. Tickets are $10; $5 children. Call 532-0522. Aiea Intermediate School's spring musical, "Once on this Island, Junior," is the Drama Club's adaptation of a Broadway show, a touching story based on Hans Christian Anderson's "The Little Mermaid." Performances are at 7 p.m. Friday and Saturday, May 2 and 3 at the school cafeteria, 99-600 Kulawea St. Tickets are $3 in advance; $5 at the door. Call 483-7230, ext. 273. A silent auction will be held for the run of the production. St. John Vianney School will host a fundraising luau, 6 to 10 p.m. May 2 on the school grounds. Along with Hawaiian food, the event will include a country store, silent auction, entertainment by kumu hula Blaine Kamalani Kia and martial arts demonstrations by Capoeira Besouro. Capoeira Besouro, directed by Mestre Kinha of Rio de Janeiro, Brazil, will provide classes in capoeira, maculele (a stick fighting dance), Samba de Roda, Afro-Brazilian dance, singing, capoeira instruments and Portuguese language. Tickets are $20; keiki menu, $3. Tickets are available at the school office through Friday. Proceeds will help fund capital improvements at the school. Call 261-4651. A small school can be a mighty one. 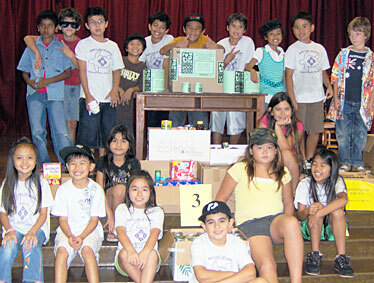 The 151 students of Queen Liliuokalani Elementary School collected more than 450 pounds of food in two weeks for the Hawaii Foodbank's Food Drive. The third-graders in Crystal Doi's class won the competition to bring in the most donations -- 212 cans of food -- and were treated to an ice cream party on Friday. Kasie Kashimoto, an Iolani School eighth-grader, won Japan Airlines' haiku contest, were among more than 2,000 regional entries. Her piece will be published in "Haiku by World Children, Volume 10; Impressions of Wind."